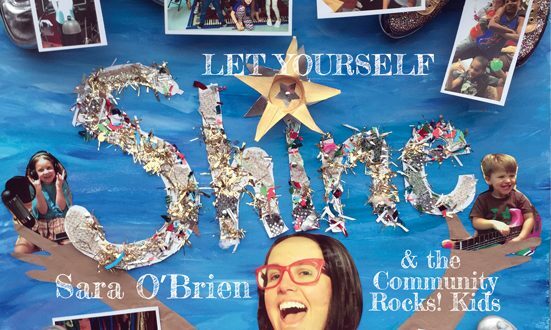 Perfect for any day and any season, New Jersey’s Sara O’Brien and The Community Rocks Kids, have the answer to your kids’ summer boredom and winter blues. Some adults might even find themselves humming along to the 11 tracks in Let Yourself Shine! According to O’Brien’s PR team, “this is music with a message, music that makes a difference and makes you laugh.” I did laugh. I’m not sure that it made a difference in my day, but it certainly put a smile on my face. I also applaud any efforts to help children be themselves and reach their full potential. That’s a no brainer. Starting out strong with “Thankful” O’Brien and her team of children singers engage the listener from the get go and keep taking on songs that fit together like a fun puzzle. O’Brien even enlists her daughter to the team – taking the lead vocals on “Loose Tooth.” The lyrics are innocent and might be pretty trite to us adults, but the repetitive chorus is simply contagious. The eighth track, “Taking Turns And Sharing” actually has a bit of a punk vibe going for it. This song stood out as the most repetitive to me, but I still enjoyed listening. It’s sometimes a bit quirky listening to these life lessons put to music, but after immersing myself into these tracks for a whole weekend, it feels no different from the relentless lineup of Top 40 music (“Mmmm Bop” by Hanson, that summer they played “Butterfly” by Crazy Town over and over, the horrifying “How Do I Live? By LeeAnn Rimes and who can forget “Uptown Funk.”). What I’m getting at is that O’Brien has struck that magical chord– the songs are memorable and quick. She can also sing. She’s not hitting any high notes off the piano like Prince, but she can hold her own. I especially liked her range and fortitude in “Thankful” and again in “Love Makes The World Go ‘Round.” She even gets some giggles in the uber fun “Halloween.” Let’s give her a special treat for her witching ways. “Make My Day” is a standout track solely on the overall message. “Be nice to everyone.” As an adult, I thought ‘duh,’ but I imagined my 5-year-old self, needing these gentle reminders. Again, so simple, yet powerful. I would like to make note that I wasn’t especially grooving to the rap in the sixth track “Love, Love Love” but I’m not about to call out a kid. If O’Brien herself would have rapped on this track, well, I might have squirmed and skipped to the next track, but I will politely say that I think the rap needed some improvement. I just wasn’t feeling it. Nope. Overall, I give high kudos to Sara O’Brien and The Community Rocks Kids. Their self-released album Let Yourself Shine has strong reminders to music lovers of any age to love. It’s just that simple. Kids, tell your parent or parents to stop lollygagging and download these treasures now.